The Usher Hall in Edinburgh is one of the prestigious concert halls in the city. It is home to the Royal Scottish National Orchestra and the award winning Scottish Chamber Orchestra. With corridors of Sienna marble, the Usher Hall in Edinburgh can seat nearly 2400 people. Improvements have been made to the stage and the hall to make it a fine concert hall, a perfect setting for music concerts, civic ceremonies and corporate events. The hall boasts of excellent acoustics and is a prime venue for the Edinburgh International Festival. The Usher Hall in Edinburgh is situated just off Lothian Road in west-central Edinburgh The Hall is a gift to the city from Andrew Usher, a brewer and distiller. The foundation stone for this hall was laid by King George V and Queen Mary in 1911. 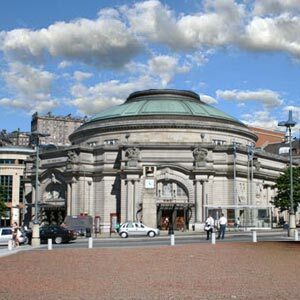 The Usher Hall is now managed by the City of Edinburgh Council. It has undergone extensive renovation and refurbishment. Its cleaned copper roof adds a fillip to the skyline of Edinburgh. The round beaux-arts listed building with a frontage of beautiful sculptures by Birnie Rhind, Crosland McLure and H.S. Gamley has been the venue of classical music concerts since 1914. Currently, the second phase of renovation is on hold due to the soaring costs, which are estimated to be around ?10.4 million. The hall has seen the hosting of the 1972 Eurovision Song Contest as well as performances by The Rolling Stones, Bing Crosby, Simple Minds and Bjork.